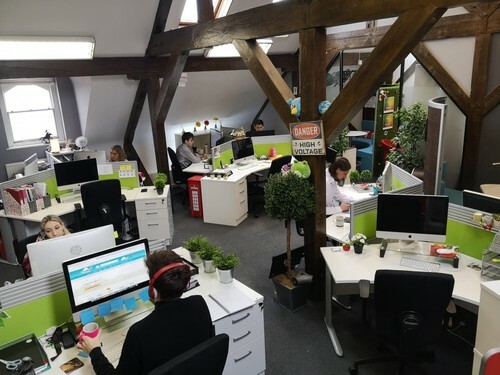 Farnham-based web developers and marketing specialists Thunderbolt Digital Limited has been shortlisted for Small Biddable Agency of the Year at the 2019 UK Biddable Media Awards. The awards ceremony will take place in London at the Montcalm Marble Arch on March 7 2019. The UK Biddable Media Awards celebrate and reward the expertise, talent and achievements of the UK’s leading biddable media agencies, publishers, technology providers and professionals. The biddable media industry is part of the global advertising industry. In 2019 it is forecast that companies around the world could spend up to 563 billion US Dollars (USD) on advertising*. The Biddable industry itself is a fast-growing area in digital advertising, helping businesses to reach their targeted audiences through various means including Pay per Click advertising (PPC), Social Media paid adverts and Video/YouTube display advertising. Through these processes, businesses can run digital campaigns on Google and other paid networks which could engage up to 80% of global internet users**, vastly improving the chances of increased traffic to a business’s website and help to converts more visitors into sales. Thunderbolt have been shortlisted for the award after entering for the Luxury Swiss watch maker Raymond Weil to promote their new range of watches dedicated to David Bowie. They were responsible for the PPC, social media management and digital strategies behind Raymond Weil from 2017 - 2018. Thunderbolt were also responsible for the social media management, paid search and SEO behind Aemyrie, a start-up project for a luxury ‘outdoor kitchen’ retailing at £25,000+ by Aemyrie. Within one month, Aemyrie had 360 registered interest leads which in part helped secure Aemyrie’s first order from the Jordanian Royal Family. Thunderbolt founder and CEO Saybhan Delilkhan said “We are thrilled to be shortlisted for our first UK Biddable Media Award. After winning at the Surrey Digital Awards in 2017 and 18, to be shortlisted for a National Award is testament to the effort my team makes in delivering successful digital campaigns to help companies grow online”. Thunderbolt is a full-service digital agency created to help SMEs grow online. Larger agencies often have the stigma of being ‘too expensive’, so Thunderbolt Digital was set up to combat this objection and create compelling digital strategies to help SMEs grow and to get better quality leads. If you would like an interview with Saybhan Delilkhan, please do not hesitate to get in touch and we will be happy to arrange this. Media information provided by Famous Publicity. For more information please contact Steven Hanlon at Steven@famouspublicity.com or call 0333 344 2341. Established in 2013, Thunderbolt Digital was founded by Saybhan Delilkhan, who has more than ten years of experience in digital marketing. Having previously worked in sales, Saybhan is passionate about delivering results for clients. He manages a team of nine, including specialists in web design, social media, digital advertising and marketing. The firm’s ethos is “work hard, play hard”. To this end, staff members have a creative, fun work environment and receive free massages from a therapist each month. This press release was distributed by ResponseSource Press Release Wire on behalf of Thunderbolt Digital in the following categories: Children & Teenagers, Men's Interest, Entertainment & Arts, Women's Interest & Beauty, Consumer Technology, Business & Finance, Education & Human Resources, Media & Marketing, Computing & Telecoms, for more information visit https://pressreleasewire.responsesource.com/about.